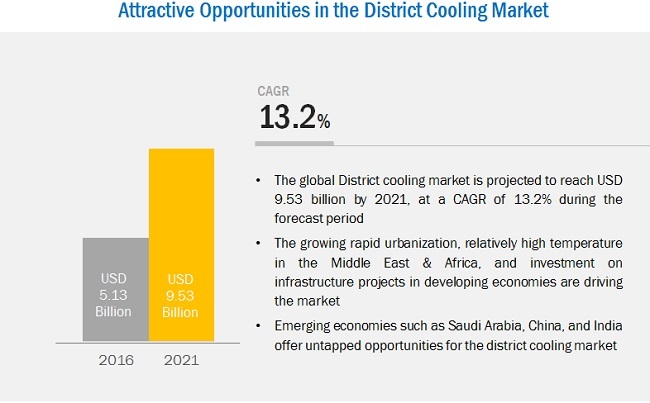 [171 Pages Report] The district cooling market is expected to grow from USD 4.61 billion in 2015 to USD 9.53 billion by 2021, at a CAGR of 13.19% from 2016 to 2021. District cooling is the production and distribution of chilled water from a central source to enable air conditioning. District cooling is apt for large-scale, high-density developments such as downtown business districts, airports, military bases, university campuses, residential towers, and commercial establishments. District cooling plants can use a variety of conventional fuels such as coal, oil, or natural gas. 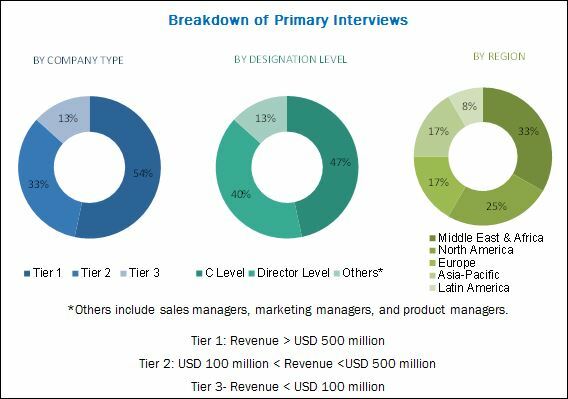 The global district cooling market is expected to witness a high growth rate due to the increasing awareness about environmental protection and changing preference of manufacturers from conventional to energy-efficient cooling technology. The base year considered for the study is 2015, and the forecast has been provided for the period between 2016 and 2021. The demand for district cooling will be fueled by the rapid urbanization, globally. According to the United Nations, in 2014, around 54% of the world’s population resided in cities and is projected to increase to 66% by 2050. The leading urbanized regions, namely, Northern America, Latin America & Caribbean, and Europe had 82%, 80%, and 73% of urban population, respectively, in 2014. The urban population in these regions is expected to increase in the future. However, the Asian and African regions are likely to urbanize faster in comparison to other regions. The research methodology used to estimate and project the market size included the ‘top-down’ and ‘bottom-up’ approaches. The total size of the district cooling market was calculated and accordingly, weightages were provided for various segments. This was done on the basis of extensive primary interviews and secondary research based on the information available on websites of various associations such as International Energy Agency (IEA), International District Energy Association (IDEA), and Euroheat & Power. Primary research conducted for this report included extensive interviews with key people such as CEOs, VPs, directors, and executives. After arriving at the overall market size, the total market was split into several segments and subsegments. The data triangulation and market breakdown procedures were employed to complete the overall market engineering process and arrive at the exact statistics for all segments and subsegments. The breakdown of profiles of primary respondents is depicted in the figure below. The ecosystem of the district cooling market comprises district cooling producers and product & service providers such as Emirates Central Cooling System Corporation (UAE), National Central Cooling Company PJSC (UAE), Emirates District Cooling LLC (UAE), Shinryo Corporation (Japan), ADC Energy Systems LLC (UAE), Keppel DCHS PTE LTD (Singapore), LOGSTOTR A/S (Denmark), Ramboll Group A/S (Denmark), SIEMENS AG (Germany), Stellar Energy (USA), and District Cooling Company LLC (UAE). In January 2017, Tabreed announced the acquisition of a district cooling plant from International Capital Trading. The acquisition will enable Tabreed to strengthen its portfolio and add 11,500 RT to its existing production capacity. In April 2016, Empower plans to construct a third district cooling facility in Dubai’s Business Bay neighborhood through a USD 50.6 million contract with Gulf District Cooling. This development is expected to increase the company’s production capacity. In July 2016, Empower signed a USD 0.49 billion contract with Nakheel to provide district cooling services to Jumeirah Village Circle and Jumeirah Village Triangle. This contract will add approximately 260,000 RT to Empower's current production capacity. What are expansion and acquisition activities companies are doing? 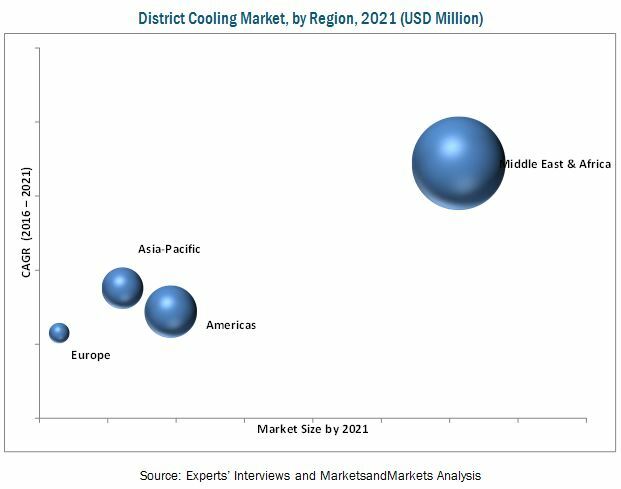 The district cooling market is expected to grow from an estimated USD 5.13 billion in 2016 to USD 9.53 billion by 2021, at a CAGR of 13.19%. The demand for district cooling is increasing due to the growth in the demand for energy efficient cooling technologies. District cooling helps to reduce greenhouse gas emission and refrigerant usage. District cooling is the production and distribution of chilled water from a central source to enable air conditioning. Chilled water is produced at a central plant and supplied to customers through an underground insulated pipes network. District cooling is suitable for large-scale, high-density developments such as downtown business districts, airports, military bases, university campuses, residential towers, and commercial establishments. On the basis of production technique, the absorption cooling segment is estimated to be the most widely used production technique for meeting cooling demand as it utilizes waste energy. Absorption cooling is expected to grow at the highest rate during the forecast period. Absorption cooling is an environment friendly means of cooling. It helps to reduce the use of electrically driven cooling in the energy system and also reduces carbon dioxide emissions. On the basis of application, the market is segmented into commercial, residential, and industrial. The residential segment is projected to grow at the highest CAGR, due to increase in cooling demand owing to rapid climate change. Rise in global temperature and increase in pollution because of heavy construction activities have resulted in to increase in demand for district cooling in commercial application. On the basis of regions, the market is segmented into Americas, Europe, Asia-Pacific, and Middle East & Africa. The Middle East & Africa market is projected to grow at the highest rate from 2016 to 2021, as countries in this region are witnessing increase in demand for cooling owing to high temperature and increasing investment on infrastructure projects; this would lead to a high demand for district cooling. District cooling systems are widely used in commercial buildings. Offices, shops, airport, retail, government, institutions, and organizations are considered as commercial buildings. The commercial construction market can be further categorized according to construction activities, namely, new construction and remodeling. Commercial buildings have more floor area and the highest total energy consumption than any other building type, creating many opportunities to save energy. District cooling system has become an integral part of commercial structures due to rise in the global temperature and increase in pollution because of heavy construction activities. Residential buildings include apartments, condominium, row houses, and individual homes. There is an increase in demand for consumer goods such as air conditioners in the residential sector. As air conditioners consume almost 50% of the total electricity used at homes, there is a rise in demand for energy-efficient cooling technologies such as district cooling. The introduction of smart homes and green building technologies has positively impacted the district cooling market. Increase in disposable income of people, the need for saving energy, and rapid climatic changes are expected to drive the district cooling market in the residential segment. The application of district cooling is more complex in the industrial segment than in the residential and commercial segments. Industrial premises are divided into three areas, namely, production area, office area, and warehousing area. Among the three, the production area has a defined set of requirement for different temperature and different kind of production. Big industries are always looking for ways to reduce the costs by optimizing their energy usage. Industrial buildings require a lot of energy to run their various processes. Use of district cooling in industrial buildings help to reduce costs related to energy wastage. Industrial owners are looking for energy-efficient cooling technologies for warehouses, control rooms, distribution centers, and production facilities to increase the optimum use of energy in these areas. What are the upcoming production techniques for district cooling? There are certain factors that restrain the growth of the district cooling market. Some of these are, the high upfront capital cost and non-synchronized development decisions. Contracts & agreements, expansion, and acquisitions were the major strategies adopted by most players in the market. Companies such as, Emirates Central Cooling System Corporation (UAE), National Central Cooling Company PJSC (UAE), and Emirates District Cooling LLC (UAE) were the key players who adopted these strategies to increase their production capacity, customer bases, and to stay ahead of competitors. Companies aim to further increase their production capacity and the geographic presence to cater to the increasing demand of their end customers.